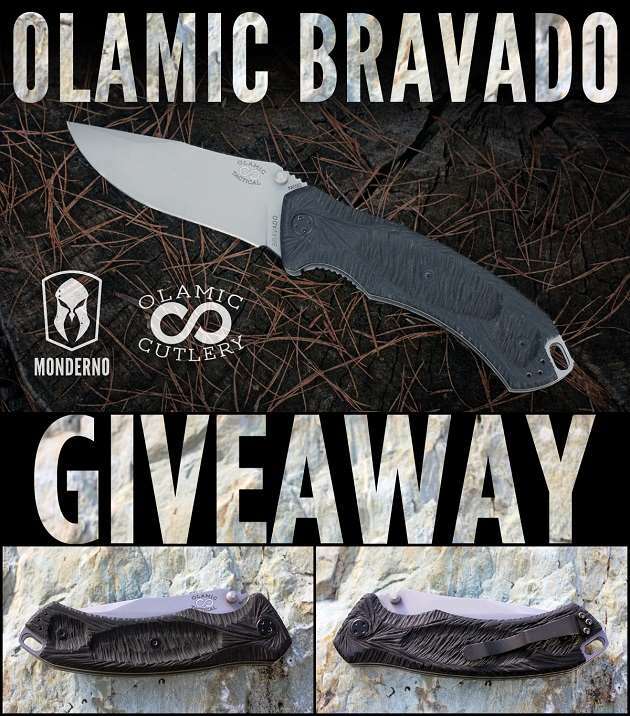 Olamic Cutlery is knife company based in Mountain View, California that makes “custom-tech” fixed and folding knives.Â Its founder, Eugene Solomonik, started the company in 2010 with the goal of offering usable, custom, handmade knives at a fair price. The knives are made in a small shop in Russia where Olamic employs a team of four craftsmen. Together they have over 75 years of knifemaking experience and each specializes in one part of the creation process. Learn more about Olamic here. Eugene recently sent us one of theirÂ awesome mid-tech Bravado foldersÂ to give away, so if you’re interested, read on. The Bravado is a large thumb-opening folding knife. We wanted to use Bohlerâ€™s N690 steel and decided to employ an Italian specialist for the blades because of their expertise with grinding and heat-treatment of this particular steel. The knife is then assembled and customized in-house, including custom scales and lock adjustment. An additional feature is the inclusion of a stainless threaded cylinder through the scale to ensure proper clip fastening. All hardware including standoffs is heat treated stainless. The pivot is a spanner-style and we include the necessary tool with purchase. Learn more about the Bravado and view high resolution photos here. Thanks to everyone who entered. The random.org space aliens have spoken, and the winner is S. Currie. If that’s your name, check your messages (other category) on Facebook, because you won. If that’s your name and you don’t see a message from me, contact me and let me know. Now that is one beautiful piece! Great edc! Now that’s badass right there. Thank you Olamic and Monderno! If I could win just ONE Monderno contest, this might be the one. Thanks for the opportunity! Thanks to Team Monderno for a great contest and being selected as the winner. I will post some more pics on FB when I get it.